THE Klang Valley residential property market was generally quiet with very few launches in the first quarter of 2015, says Savills Malaysia associate director Nabeel Hussain. Market sentiment remains weak for high-end properties due to the recent implementation of the Goods and Services Tax (GST) and other factors such as inflation, political uncertainties and volatility of global oil prices, he notes. “However, residential properties in the affordable price range, mostly below RM500,000 each in general, are still seeing high buying demand,” he says in presenting The Edge/Savills Klang Valley Housing Property Monitor 1Q2015. He cites recent data from the National Property Information Centre (Napic), which shows lower residential property transaction volume and value in Kuala Lumpur and Selangor in 1Q2015, compared with 4Q2014. 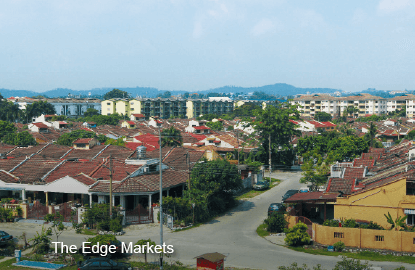 The supply for this house type in the Klang Valley remained limited but prices continued to trend upwards, especially for well-maintained units in good locations. This segment saw an average growth of about 17%, which was higher than for 2-storey terraced houses and high-rise units, says Nabeel. In 1Q2015, the prices of 1-storey terraced houses in Bangsar Park and Taman Tun Dr Ismail’s (TTDI) Aminuddin Baki rose by 10% and 13.04% respectively quarter on quarter (q-o-q). 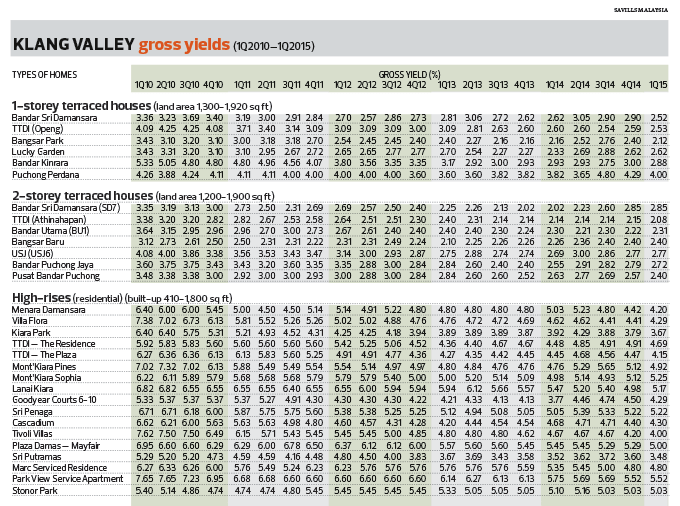 Prices in Bangsar Park, Puchong Perdana and TTDI’s Burhanuddin Helmi rose by more than 20% year on year (y-o-y). A 1,875 sq ft unit in Bangsar Park soared 30% to RM1.3 million from RM1 million while a 1,300 sq ft unit in Puchong Perdana jumped 36.36% to RM300,000 from RM220,000 y-o-y. A 1,920 sq ft unit in TTDI’s Burhanuddin Helmi spiked 20% to RM1.08 million from RM900,000. “Other mature and established areas such as Kepong, Petaling Jaya, Sri Damansara and Puchong also enjoyed positive growth,” Nabeel says, attributing this to available amenities such as food outlets, shopping centres, schools and hospitals. This segment still has room for growth as supply is limited. The strong demand, coupled with the lack of supply, especially for units in strategic locations, are driving up prices, he explains. The rental market for 1-storey terraced houses remained stable for the quarter under review compared with the preceding quarter, with the exception of Bandar Sri Damansara, where rent fell to RM1,300 from RM1,400 q-o-q. Y-o-y, rents rose by an average of 19.9%, with Bangsar Park recording a 27.8% rise — the highest in the segment. This type of dwelling remained the popular choice in the Klang Valley. 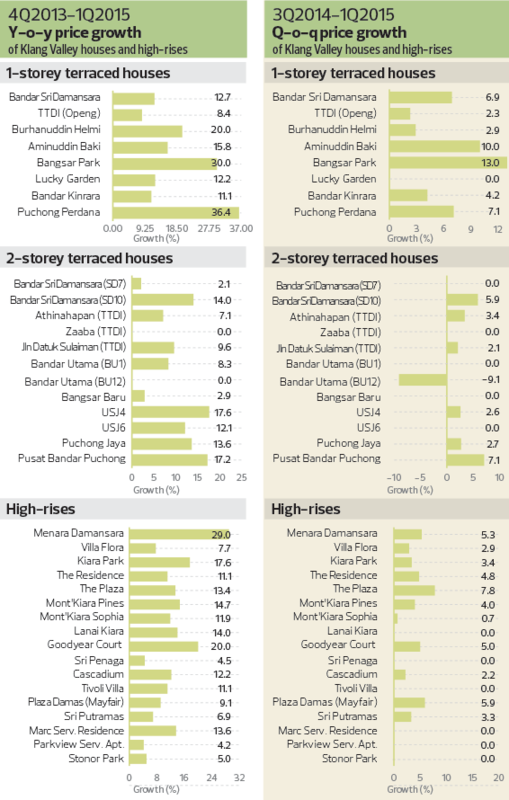 Prices of selected 2-storey terraced houses recorded an average of 7.3% growth y-o-y, with Puchong and USJ, in particular, experiencing stronger growth of about 15% y-o-y, says Nabeel. “Given the popularity of such houses, mature catchments are likely to see further growth resulting from the limited supply,” he adds. Houses in TTDI, Bangsar and Bandar Utama recorded selling prices of RM1.3 million and above, proving these properties are solid investment assets. However, Nabeel says this may not apply to locations like BU12 and TTDI’s Zaaba, which have been sluggish in recent periods. For the quarter under review, prices of 2-storey terraced houses grew by an average of 1% in selected neighbourhoods. Prices in USJ4, Puchong Jaya and TTDI’s Athinahapan grew by 2% to 3%. The two areas that saw the biggest quarterly price rise were Bandar Sri Damansara (SD10) and Pusat Bandar Puchong, by 6% and 7.1%, respectively. “These areas are mostly mature catchments with established infrastructure and limited supply of houses. This has been able to drive the healthy demand as these properties are solid investment assets in the long run,” says Nabeel. The development pipeline for 2-storey terraced houses is moving further away from the city centre as a result of land scarcity. Thus, buyers can choose purchasing a home in secondary locations at more affordable prices or pay a premium for units nearer to the city centre. Moving forward, the Klang Valley Mass Rapid Transit (MRT) project is expected to attract more activities in areas close to the stations, leveraging the improved accessibility. Rents remained stable across the board. A 1,650 sq ft unit in BU1 in Bandar Utama rose to RM2,500 from RM2,400 q-o-q. 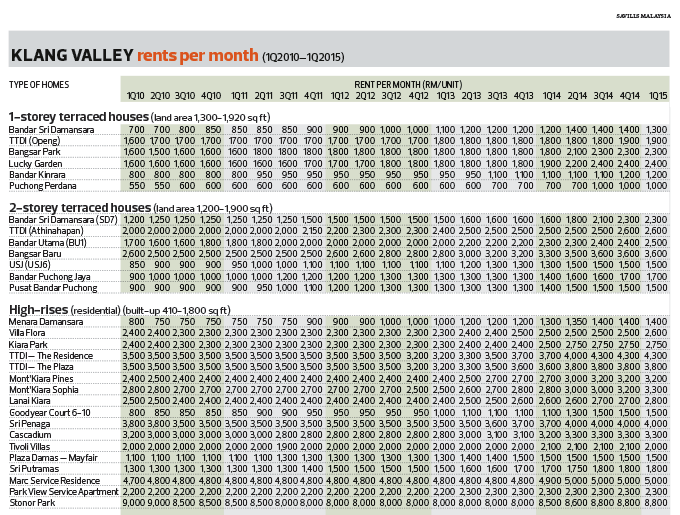 Rents grew by an average of 15.64% y-o-y, with a 1,650 sq ft unit in SD7, Bandar Utama, seeing a 43.75% increase. The high-rise residential sector saw slight growth q-o-q in areas such as Menara Damansara, The Residence in TTDI and Mont’Kiara Pines. However, price movements were not more than 6% for the quarter under review, following a moderate previous quarter. Nonetheless, high-rise developments have been getting more popular in the past few years in areas where land for development is scarce, such as KLCC and suburbs like Bangsar, Mont’Kiara, Subang Jaya and some parts of Petaling Jaya. Interest in such products is still high mainly due to their affordability compared with landed properties, apart from the facilities, management and security, Nabeel says. In the period under review, most condominiums saw a slight increase in transacted value except for developments in Bangsar and the KLCC area, Nabeel notes. “Popular residential areas such as Mont’Kiara and TTDI continued to experience price growth during the review period, thanks to their ‘all-in-one package’ of strategic location, excellent accessibility, established communities and safety,” says Nabeel. 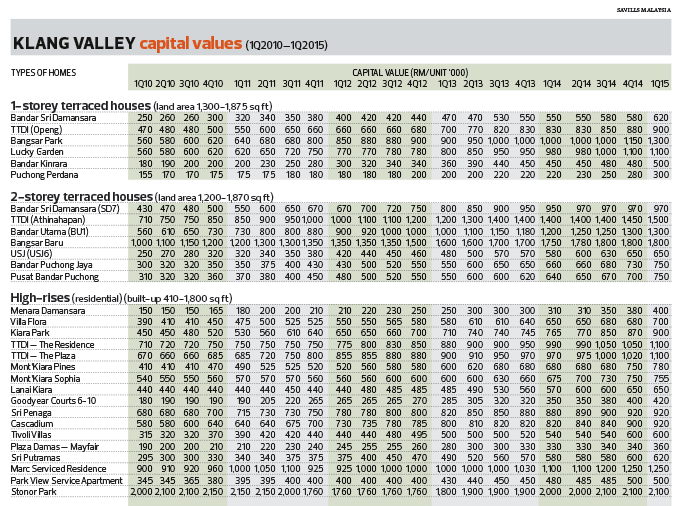 The upcoming MRT line, with a station in TTDI, will also help to boost prices of high-rise properties nearby. A 916 sq ft unit in Menara Damansara, Bandar Sri Damansara, recorded a price growth of 29.03% to RM400,000 from RM310,000 y-o-y, while a 1,008 sq ft unit in Goodyear Court 6-10 in USJ rose 20% to RM420,000, from RM350,000 last year. The high-rise residential segment saw price growth in mature suburban neighbourhoods such as Bandar Sri Damansara, TTDI and Mont’Kiara. These areas are perceived to offer good value compared with prices of new high-rise residential developments, Nabeel says. For the quarter under review, there was an increase in supply for the high-rise residential market. Price growth was thus determined by location, living quality and surrounding amenities. Nonetheless, most of the older apartments and condominiums in KL are now selling for well below owning cost, meaning they should remain a stable investment. Rents were stable for this segment q-o-q. A 1,421 sq ft unit in Lanai Kiara in Mont’Kiara rose to RM2,800 from RM2,700 while a 818 sq ft unit in Tivoli Villa in Bangsar fell to RM2,000 from RM2,100. On average, this segment saw rental growth of 7.92% y-o-y, with Goodyear Court 6-10 seeing the highest rise of 36.4%. This article first appeared in City & Country, The Edge Malaysia Weekly, on June 15 - 21, 2015.